This time around on Bench Press, we talk with Devin Champlin of Champlin Guitars in Bellingham, Washington. A lifelong woodworker, Champlin knows the sounds he wants, and he knows how to get them. 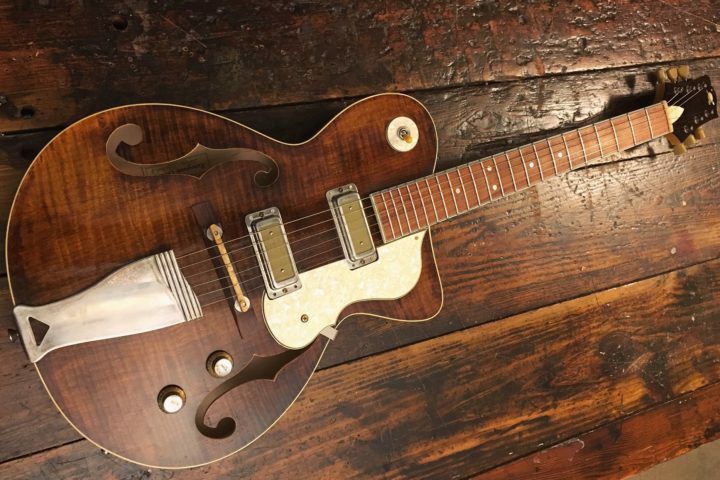 He does most everything by hand, remarking, “I just enjoy doing things the slow way,” and favors small body guitars from the early twentieth century that fell out of vogue when their large body contemporaries hit the scene. As we sat down with him, he tells us all about his process, his backyard shop, and some of his “basket case” projects along the way. Beyond his skills on the workbench, Champlin also plays in a number of bands in the Bellingham area including The Sons of Ranier, The Shadies and The Crow Quill Night Owls. 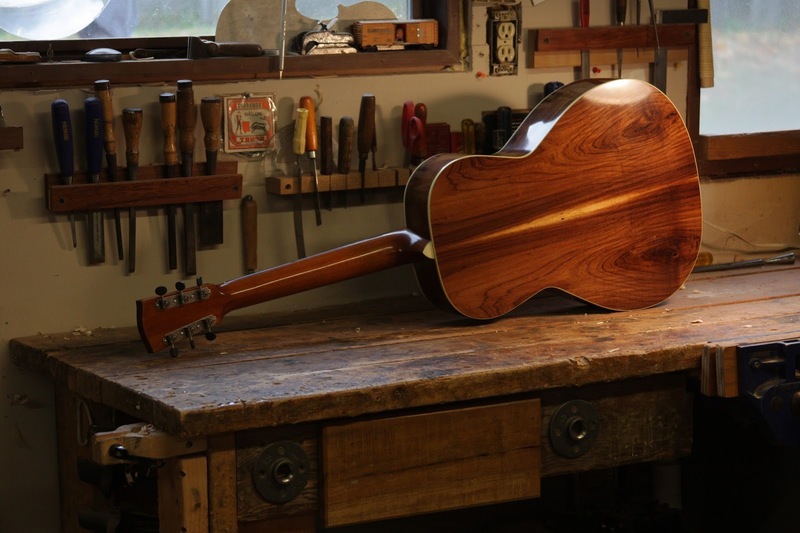 Devin Champlin: Right now, I’ve got a Nick Lucas-style, deep-body 00, with walnut back and sides and a spruce top. I’m working on a parlor-size archtop right now that’s also walnut back and sides, but this one’s with a cedar top. And then I’m actually working on a solid body electric guitar that I’m building for my dad. I think it’s only the second electric guitar I’ve ever made. The last one I’m working on is my concert size model, which is kind of like a large parlor size. The first two I mentioned were commissions, but this one I’m building just for fun, kind of a little experiment. It’s going to have a floating bridge with tailpiece and a thinner top, almost like a Selmer-Maccaferri design that’s a flat top but it’s domed under tension against the bracing. And then there’s always a constant flow of repairs coming through. 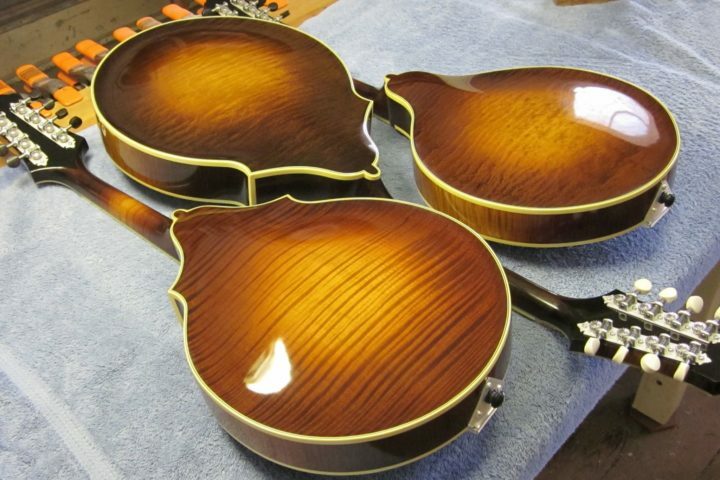 FJ: Archtop parlor guitars aren’t exactly something you see all the time. How’d that come about? DC: That was a custom order. She had the idea for it, and I’ve built one other small body archtop that wasn’t quite this small, but that guitar came out really great. We’re going with cedar and x-bracing, almost trying to fight against its tendency to be this small, bright, punchy thing. It’s going to be that, no matter what, but we’re trying a few things to tone it down a bit. FJ: How did you get your start building? DC: I’ve been playing music and doing woodworking all my life. I was working as a carpenter through my early twenties and bringing home scraps of wood, doing woodworking projects at home. At that time, I was also tinkering on my own instruments. 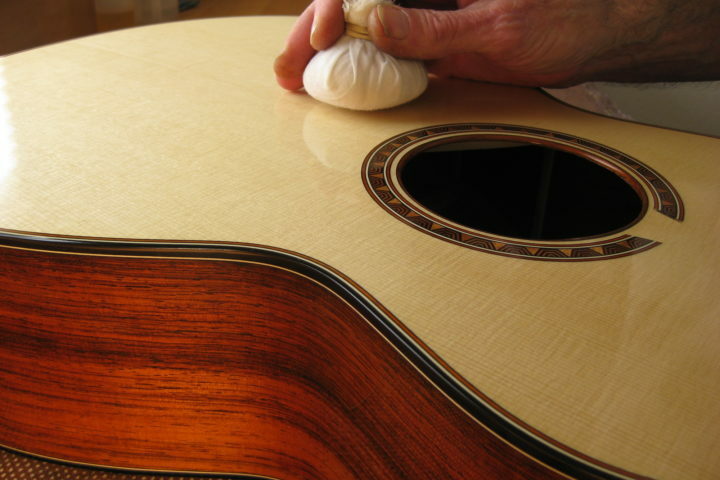 I had a friend who went to Roberto-Venn, and I was like, “Wow, I didn’t even know there was such thing as a luthier school!” I ended up going a couple years later, so that was the fall of ’06, and that was where I got my real education. I built three guitars there. 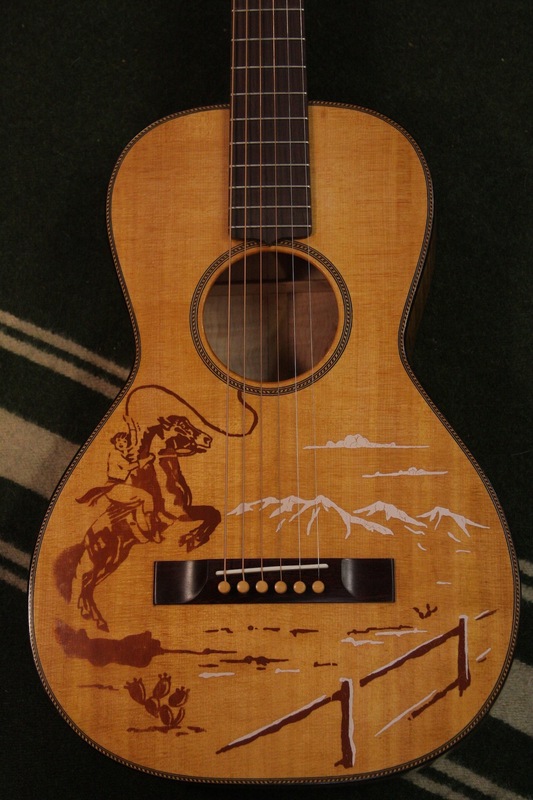 My favorite was a ladder-braced parlor guitar I based off this old Washburn I had. My teachers were super supportive, but they didn’t really know what to do with that. It was kind of an oddball, but it came out great. Then a couple years later, I got to work with Todd Cambio of Fraulini Guitars. 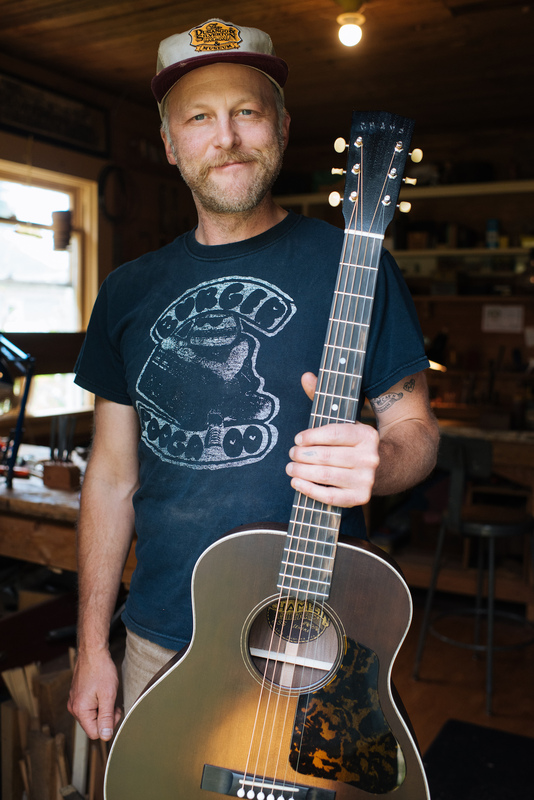 He does a lot of stuff that I was into, and I was basically just building a lot of small-body guitars using ladder bracing and a ton of domestic woods, white oak and stuff like that. He is just such an amazing builder so I was really, really fortunate to work with him. I consider him my mentor. FJ: Do you have a favorite instrument that’s crossed your bench? DC: I love doing repairs. I do a lot of basket cases for people. I end up being the guy people come to when they have that weird wall-hanger parlor guitar that most people don’t want to work on. 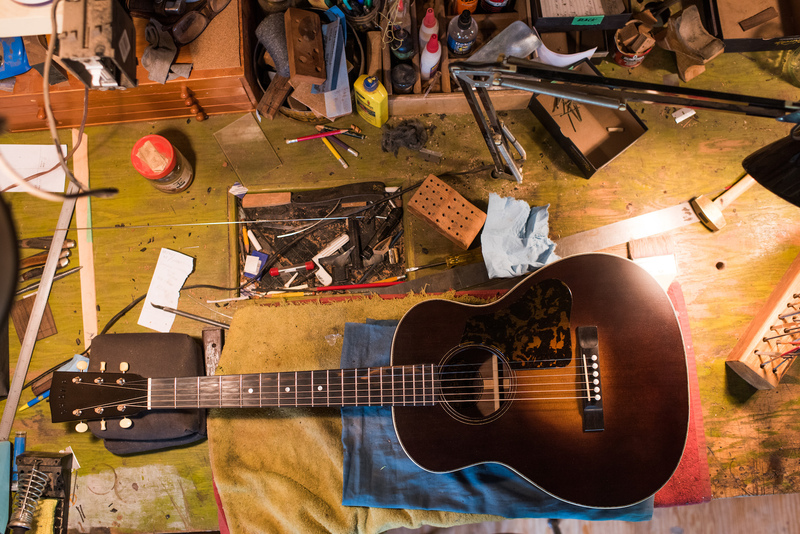 I’ve gotten to take apart and really dive into a few guitars from the turn of the last century. 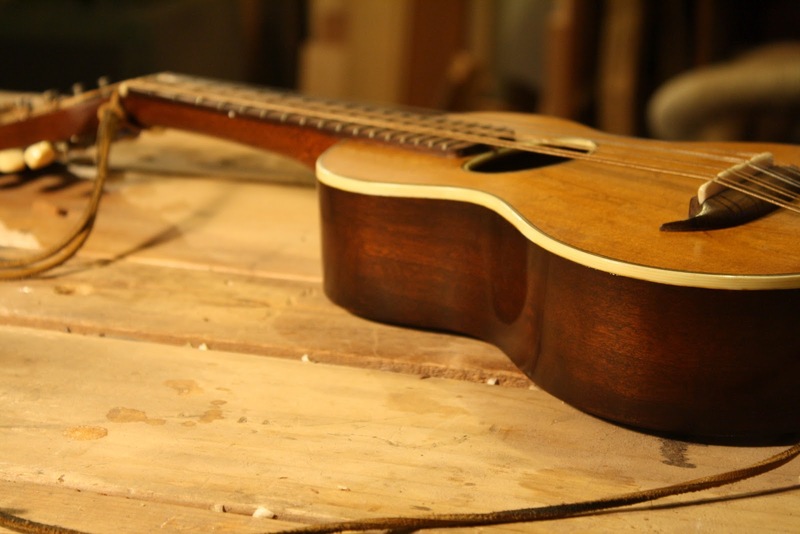 Most recently, I was working on a no-name parlor guitar that’s made of mismatched white oak back and sides. It was super beautiful, and it sounded amazing. It’s just so cool because I didn’t know its history from the time it was built till now, but I think a lot of that time was spent just hanging on a wall and people thinking, ‘Oh, that’s not a real instrument.’ It’s an amazing sounding guitar now that it’s got a proper set up on it. FJ: Could you tell us a bit about your shop? DC: I’m located in Bellingham, Washington, which is just a little bit south of the Canadian border on the water. It’s a home shop, a little separate building in the backyard which is just great. It was built in the ‘40s and it’s all beautiful Douglas-fir walls on the inside, just very cozy. It’s a lot smaller than my last shop. I’ve actually only been over here for about a year. I’ve bounced to a couple different places over the last few years, but I think I’m going to stay here for a long time. I pretty much get to just make my coffee and walk out here every day. FJ: How do you balance tradition and innovation in your builds? DC: I don’t think tradition and innovation have to be mutually exclusive at all. You certainly could get into building replicas or something like that, but I’m somewhere in the middle. I’m just old school in my aesthetics. I play old time music, fiddle and finger picking blues, so my general sound and aesthetic that I’m shooting for sits more on that end of things. But I love branching out and seeing what other people are doing, too, and I love to try new things. I think that some people who are really inspiring to me as a builder who really do a great job of breaching that gap of tradition and innovation are Jason and Pharis Romero of Romero Banjos. Their stuff looks old and modern at the same time. FJ: You’ve mentioned repurposing old tables and things like that for tone woods. Tell us a bit about that. DC: It’s not necessarily the focus of what I do, but it is something that I love. I used to work at a place here in Bellingham where we took apart buildings and repurposed wood, which is when I got started with that. I once got this old coffee table with this figured walnut that I could have restored to a table, but I decided to cut it up instead to build a guitar. Then there are also things that are just forgotten trash. I got this redwood plank that was clearly being used as just a shelf in a garage, and it had years of dirt and paint can silhouettes on it. I could tell it had pretty good grain, but oh my gosh, when I planed it down, it was just amazing. I love to find that stuff. I have a batch of used pieces of wood that probably would have been trashed or forgotten. FJ: Do you have a particular philosophy about wood/materials or about building as a whole? DC: As far as wood selection, I much prefer domestic woods. I love using walnut, maple, anything that grows around here. Not only is it nice to work with, but it also just has more of a traceable path where it comes from, and I feel better about it that way. I still do use a lot of exotics because people request it. If I had it my way, I would always build with domestic woods, because I think they are great tone woods. I think people get stuck in a traditional mindset, they want that rosewood. As far as my building philosophy, I’m pretty old school and simple. I like using hide glue, and I love sharpening my chisels and doing most stuff by hand. I could make arguments that it makes a better product, but overall a lot of it is just about the personal experience and how much I enjoy what I’m doing. I have templates and stuff so I can repeat things, but I have little interest in doing CNC or stuff like that. Some people are into it and I totally respect that, but for me, I just enjoy doing things the slow way. FJ: Any upcoming projects that you’re particularly excited about? DC: I’m excited to hear that little domed flattop I was telling you about. I’ve made a couple Selmer-Maccaferri-style guitars that will be coming out soon. I’ve been excited about exploring that realm a little more, the flattop guitar that has its top bent unusually. I’m really excited about all of it. I just love coming out here and building.